The self proclaimed “God of genocide” in Srebrenica, the Serbian ethnic general Ratko Mladic was arrested today in a small village eighty kilometers from Belgrade. Mladic sheltered there with a relative, and lived under a false name. For years on end he hid like a house-mouse, and was arrested with a similar meekness. Old, docile, with one hand crippled, the formerly ferocious warlord lived peaceably and invisibly in a house that had been searched repeatedly by the Serbian police. This long-wanted war criminal and exceedingly successful fugitive from justice had a 10 million euro award on his head. And yet, recent polls say that, despite the suffering and ignominy he brought them, 51 percent of Serbian citizens would not have given him up to the international war tribunal in the Hague. No, not for any money. Serbian stubbornness has gone beyond the period of Mladic’s bloodstained hero-worship. Nowadays the Serbs have grown indifferent to Mladic while actively resenting the European Union, whose economic disorders have made Serbian life miserable. And yet it appears that somebody did betray Mladic for the reward: someone among his circle of close friends. Some years ago, an entire group of people, who were all accused of actively sheltering Mladic, were released from a Serbian court through lack of evidence. Mladic seems to have been babbling, but he managed to say, according to his lawyer, that he does not recognize the war tribunal in Hague, and will not plead guilty or innocent. He was armed with two pistols when he was arrested, but he gave himself peacefully. Who will pick up the 10 million euro reward? How much prosperity did Ratko Mladic cost Serbia over these 16 years? These money issues are the big questions in Serbian press. Although the police said they will not take a penny, they did their regular job. More recently, European pressure has intensified from the Hague tribunal; on June 6 the Serbian government faced a grim report from Serbia by Serge Brammertz, citing them for non-cooperation with the United Nations. Europe is experiencing many difficulties, but Serbia, like a tin can tied to a cat’s tail, suffers them even more so. The primary obstacle to Serbia’s European harmonization is and was, of course, the genocidal war criminal Ratko Mladic. We citizens of Serbia all knew that Mladic was hiding among us in Serbia; don’t ask me why, but we never believed the many tales spread about his death or his exile. Given his modest rural circumstances, he was concealed more discreetly than the Pakistanis hid Osama bin Laden — but the parallels there are obvious. Mladic had his protectors in the covert wing of the government, and the Serbian government is traditionally an enterprise in which everything is covert, and yet everybody knows. Ask them not why they turned him in, but why they delayed until today. A couple of years ago, Radovan Karadzic, the mastermind of the ethnic cleansing in Bosnia, was arrested in downtown Belgrade. Dr. Karadzic had been hiding under a long beard as a New Age quack guru. Witnessing this travesty on television, my aged father said: Ratko Mkadic is a soldier! He will never do a thing like that! He will rather commit suicide than humiliate himself in that manner or get arrested by police! Mladic will never go to The Hague! The same myth of fearless valor was running for the late president of Serbia, Milosevic who actually was arrested and died in The Hague. Milosevic was a close collaborator with the Bosnian Serb warlords, Karadzic and Mladic, in surpressing the Muslim population of Bosnia. This demon dream team of Balkan genocide: Milosevic, Mladic and Karadzic, were all destined for The Hague. They were playing chess with one another in the anteroom of justice, waiting for a sentence longer than their lives. Only death could bring them peace and liberation. Radovan Karadzic sent immediately from the Hague a message to arrested Mladic: I am sorry this happened, but I will help you out, we will work together for the truth! Some years ago I wrote a book on genocide in Srebrenica, the largest single war crime in Europe after World War II. My first question, after analyzing the design of crime was: how did they manage to exterminate eight thousand people in a couple of days? How could they hide thousands of bodies from the international community, from the people present there, from the bereaved families? After the recent capture of Osama Bin Laden, Ratko Mladic was the fugitive number one in the world. The US president Obama said he was happy Serbia perfomed its duty. The world press is giving all the credits to the pro-European government of president Boris Tadic, and his determined policy to pull Serbia away from the criminal past. Today in Serbia even the radical right wing opposition is officially pro-European. No one in or near power aspires to dirty their hands with the Balkan wars; that brings no benefit. Modern Serbia has a cult of tennis stars rather than warlords. These Millennial adults have won some credibility, since they impress the outside world, without any taint of the distant 1990s. 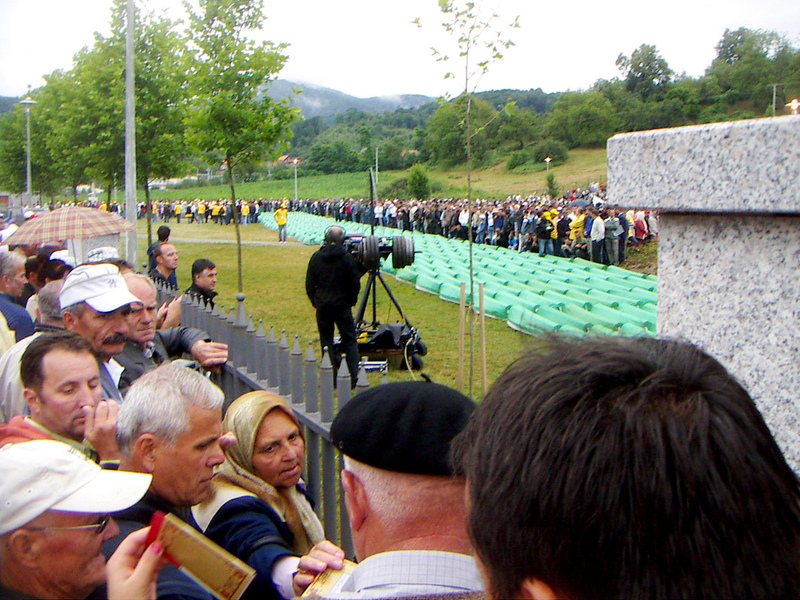 The mothers of Srebrenica victims declared themselves contented with this turn of events. They expected it many years ago; but better later than never. These women have learned to be deeply suspicious of the tribunal in The Hague; the international lawyers there declared their prize mementos and personal evidence to be bulky and useless; unfit for a modern court proceeding. So much for their cherished mementos of their dead, their hoarded proofs that the vanished dead had really lived, that they were murdered. A moment of justice is commonly liberating for the offended as well as the criminals. But the moment of truth even more so. There is no justice without truth. The arrest of Ratko Mladic and his adamant transfer to the Hague tribunal will be a litmus test for this universal and ancient motto. And for our globalized world of crime and punishment. El autoproclamado “Dios del genocidio” de Srebrenica, el general de etnia serbia Ratko Mladic ha sido arrestado hoy en un pequeño pueblo a ochenta kilómetros de Belgrado. Mladic se refugiaba allí con un pariente, y vivía bajo un nombre falso. Durante años se ocultó como un ratón y fue detenido con similar mansedumbre. Viejo, dócil, con una mano paralizada, el antes feroz señor de la guerra vivía tranquilamente e invisible en una casa que había sido registrada repetidas veces por la policía serbia. Se ofrecía una recompensa de 10 millones de euros por este criminal de guerra buscado desde hace tiempo, fugitivo aventajado de la justicia. Y, sin embargo, los últimos sondeos dicen que, a pesar de los sufrimientos y la ignominia que él provocó, el 51 por ciento de los ciudadanos de Serbia no le habrían entregado al tribunal internacional de La Haya. No, no por ningún dinero. La terquedad serbia ha ido más allá del período de culto al héroe manchado de sangre Mladic. Hoy en día los serbios se han vuelto indiferentes a Mladic mientras están que trinan contra la Unión Europea, cuyos problemas económicos han vuelto miserable la vida en Serbia. No obstante, parece que alguien traicionó a Mladic por la recompensa: una persona de su círculo de amigos íntimos. Hace algunos años, todo un grupo de personas, que fueron acusadas de proteger a Mladic, fueron puestas en libertad por un tribunal serbio por falta de pruebas. Tras su detención, sólo unos pocos borrachos se reunieron delante de su escondite, y también en el centro de Belgrado: las bandas habituales de hooligans nacionalistas. Mladic fue llevado al tribunal especial de crímenes de guerra en Belgrado para ser interrogado. Pero este esfuerzo se vio interrumpido a causa de las “difíciles condiciones psicológica y física” del ex-general. Aunque Mladic hablaba de manera incoherente se las arregló para decir, según su abogado, que no reconoce el tribunal de guerra de La Haya, y no se declarará ni culpable ni inocente. Estaba armado con dos pistolas, cuando fue arrestado, pero se entregó pacíficamente. ¿Quién va a recoger la recompensa de 10 millones euros? ¿Cuánto costó Ratko Mladic a la prosperidad de Serbia a lo largo de estos 16 años? Estos problemas de dinero son las grandes preguntas de la prensa serbia. Aunque la policía dijo que no aceptará ni un centavo, hizo su trabajo reglamentario. Como una vuelta de tuerca más, el Estado todavía adeuda al general su pensión periódica, que nunca recibió (era un fugitivo). Considerables cantidades fueron pagadas por y a otros ciudadanos del Estado – principalmente, indemnizaciones entregadas a las familias de sus víctimas. Y ¿qué pasa con los muertos? ¿Tienen un precio? Se fueron sin nombre, muchos de ellos todavía sin tumbas, ya que sus cuerpos, desmembrados y esparcidos por todo el territorio se siguen buscando. El silencio de los espíritus es más fuerte que nunca en este momento de alegría y victoria. Más recientemente, la presión de Europa se ha intensificado desde el tribunal de La Haya; el 6 de junio el Gobierno de Serbia se enfrenta a un duro informe de Serbia de Serge Brammertz, mencionando su falta de cooperación con las Naciones Unidas. Europa está experimentando muchas dificultades, pero Serbia, como una lata atada a la cola de un gato, padece aún más. El principal obstáculo a la armonización europea para Serbia es y ha sido, por supuesto, el criminal de guerra genocida Ratko Mladic. Nosotros, los ciudadanos y las ciudadanas de Serbia, sabíamos todos que Mladic se escondía entre nosotros en Serbia: no me pregunten por qué, pero nunca creímos los muchos cuentos propagados sobre su muerte o su exilio. Vistas sus modestas circunstancias rurales, se ocultó más discretamente que los paquistaníes escondieron a Osama Bin Laden, pero los paralelismos son evidentes. Mladic tenía a sus protectores en el ala secreta del gobierno y el Gobierno de Serbia es tradicionalmente una empresa en la que todo está encubierto y, sin embargo, todo el mundo lo sabe. No les pregunte por qué lo entregaron sino por qué se demoraron hasta hoy. Hace un par de años, Radovan Karadzic, el autor intelectual de la limpieza étnica en Bosnia, fue arrestado en el centro de Belgrado. El dr. Karadzic se había ocultado bajo una larga barba como un gurú curandero del New Age. Testigo de esta parodia en la televisión, mi anciano padre, dijo: ¡Ratko Mkadic es un soldado! ¡Él nunca hará una cosa así! ¡Él se suicidará antes de humillarse de esa manera o de ser arrestado por la policía! ¡Mladic nunca irá a La Haya! El mismo mito de valor sin miedo se extendió a propósito del último presidente de Serbia, Milosevic, que en realidad fue arrestado y murió en La Haya. Milosevic fue un estrecho colaborador de los señores de la guerra serbios de Bosnia, Karadzic y Mladic, para eliminar a la población musulmana de Bosnia. Este dream team diabólico del genocidio de los Balcanes: Milosevic, Mladic y Karadzic, estaban todos destinados a La Haya. Estaban jugando al ajedrez con otros en la antesala de la justicia, a la espera de una sentencia más larga que sus vidas. Sólo la muerte podía traerles la paz y la liberación. Radovan Karadzic envío inmediatamente desde la Haya un mensaje al detenido Mladic: Siento lo ocurrido pero te ayudaré, vamos a trabajar juntos por la verdad. Hace algunos años escribí un libro sobre el genocidio en Srebrenica, el mayor crimen de guerra en Europa después de la Segunda Guerra Mundial. Mi primera pregunta, después de analizar el diseño de la delincuencia era: ¿cómo se las arreglaron para exterminar a ocho mil personas en un par de días? ¿Cómo pudieron ocultar miles de cuerpos a la comunidad internacional, a las personas presentes allí, a las familias en duelo? Después de la reciente captura de Osama Bin Laden, Ratko Mladic era el fugitivo número uno del mundo. El presidente de EE.UU. Obama expresó su satisfacción porque Serbia cumpliera con su deber. La prensa mundial está dando todos los créditos al gobierno pro-europeo del presidente Boris Tadic y a su política resuelta a alejar a Serbia de su pasado criminal. Hoy en Serbia, incluso la oposición del ala derecha radical es oficialmente pro-europea. Nadie en el poder o en sus aledaños aspira a ensuciarse las manos con las guerras de los Balcanes, ello no trae ningún beneficio. La Serbia moderna venera a las estrellas del tenis en lugar de a los señores de la guerra. Estos adultos del Milenio han ganado algo de credibilidad, ya que impresionan al mundo exterior, sin ninguna mancha de la distante década de los 90. Las madres de las víctimas de Srebrenica se declararon satisfechas con el giro de los acontecimientos. Lo esperaban desde hace muchos años, pero más vale tarde que nunca. Estas mujeres han aprendido a ser muy suspicaces con el tribunal de La Haya, los abogados internacionales consideraron que sus valiosos recuerdos y testimonios personales eran pesados e inútiles, no aptos para un procedimiento judicial moderno. Esto en cuanto a los recuerdos queridos de sus muertos, las pruebas acumuladas de que los muertos desaparecidos habían vivido realmente, que fueron asesinados. El momento de la justicia es usualmente liberador tanto para las víctimas como para los criminales. Pero el momento de la verdad lo es aún más. No hay justicia sin verdad. La detención de Ratko Mladic y su traslado contundente al tribunal de La Haya será una prueba determinante para este precepto universal y antiguo. Y para nuestro mundo globalizado de crimen y castigo. This entry was posted in Uncategorized and tagged Mladic, Serbia, Srebrenica. Bookmark the permalink. It’s hard not to get all cynical, though we have to believe in the Hague Tribunal, in some sort of justice system. sure, it would have been impossible to handle this with belgrade court only! I am aware of it fully! The whole history of these three and the events that occured with them at the helm is just horrific! Wondering if you have a link to your book somewhere?